Goals of Gold Video Slot Guide & Review - Casino Answers! Goals of Gold is a 5-reel, 9-line video slot developed by Random Logic, featuring a wild symbol, a free spins feature and a bonus game. You can play the Goals of Gold video slot at Bovada. Bets on the Goals of Gold slot machine are $0.05, $0.10, $0.25, $0.50, $1, $2, $5 and $10 per line. You can select from 1-9 paylines on a spin on the Goals of Gold online slot game. The minimum bet you can make is a nickel with the maximum total bet being $90 per spin. Goals of Gold has a decent betting range, suited for casual players and high rollers. To play the Goals of Gold slot game, select your bet and press the “Spin” button. You can also play all 9 lines by pressing the “Max Lines” button to automatically spin the reels. The highest paying symbol on the Goals of Gold video slot is the Gold Trophy symbol. If you hit 5 Gold Trophy symbols on an active payline, you will win the golden 15,000 coin top jackpot. Other high paying symbols in Goals of Gold are the Stadium (2500 coins), Boots (1000 coins) and Gloves (800 coins). The Players symbol is the wild symbol on the Goals of Gold online slot. The Players symbol will substitute for all other symbols except for the scatter and bonus symbols to complete winning combinations. It does not pay out by itself. You can create many different winning combinations by using the wild symbol on Goals of Gold when you play at Bovada! If you land 3, 4 or 5 Football scatter symbols anywhere on the reels, you will win 15, 30 or 40 free spins. The free spins feature will be played with the same number of lines and bet per line as the triggering spin. All prizes, including additional free spins (which will be accumulated to the current free spins feature infinitely) can be won during the free spins feature. When 3 or more Goalkeeper bonus symbols appear on an active payline, you will trigger the Cash Cup bonus game on Goals of Gold. You will get five shots on the goal to win bonus cash. If you do not score, the bonus game will come to an end and you will keep your winnings. If you score all five, you will win the Cash Cup grand prize. The bonus game is identical to the one on the Euro Reels Video Slot. You can win up to 23,000 coins in the Cash Cup bonus game. The autoplay mode on Goals of Gold is located near the bottom-right corner of the screen. Open it up using the arrow. You can type in up to 99 autoplay spins. To begin the autoplay mode, press either “Spin” or “Max Lines.” You can stop the autoplay mode at any time by using the “Stop” button. 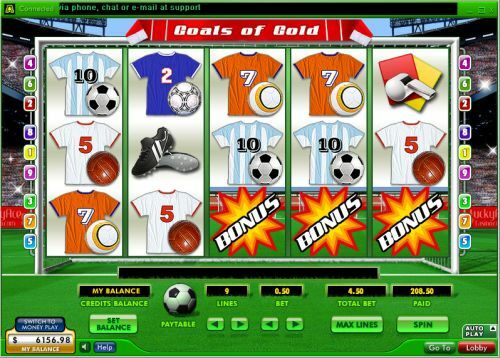 Goals of Gold is a great video slot for the football or soccer fan. It has an excellent top jackpot, a good bonus game and a free spins feature – all of which are very capable of bringing in some big wins. If you want to try the Goals of Gold video slot, you can sign up and play at Bovada! Can players from the United States play the Goals of Gold video slot for real money? No, USA players cannot play the Goals of Gold video slot for real money at this time. For a soccer video slot that you can play, please read our World Cup Soccer Spins Video Slot Review or read our list of sports themed video slots.